Hahn's macaws are the smallest and the most popular among the miniature macaws. These compact and playful parrots make excellent pets who form good bonds with their owners. These birds are capable of learning many tricks and behaviors and can become good talkers with practice. They do exhibit many typical macaw behaviors such as screaming. Yet, they are a good choice for the bird lover who wants a macaw but isn't quite ready to take on one of the big guys. The Hahn's macaw is one of two varieties of red-shouldered macaws. The Noble macaw (Ara nobilis cumanensis) is the other, and both are native to northern South America. In the wild, they live in Bolivia, Brazil, the Guianas, Peru, and Venezuela. They're most likely to be found in the tropical lowlands, though these parrots also enjoy the savannas and swamplands. The macaw's green feathers blend perfectly into the bright foliage of these areas. Hahn's macaws tend to form small flocks in their natural habitat. They spend most of their mornings foraging for food, including berries, fruits, flower buds, nuts, and seeds. Sometimes they will eat insects, and they can often be found on clay cliffs. The clay is a dietary supplement that helps remove any toxins they may pick up from their normal food sources. The Hahn's macaw is the smallest of all macaws, measuring just 12 to 14 inches from its beak to the tip of its tail. Their beautiful green tail is just as long as their body. This compact size makes them suitable for bird lovers who live in smaller spaces or anyone with children. However, apartment living may not be best for these birds because they can be quite noisy. These birds can live for more than 30 years. With proper care, a happy Hahn's macaw can even live up to 40 or 50 years, so this is definitely a long-term pet. Intelligent and charming, Hahn's macaws are naturally popular pets. 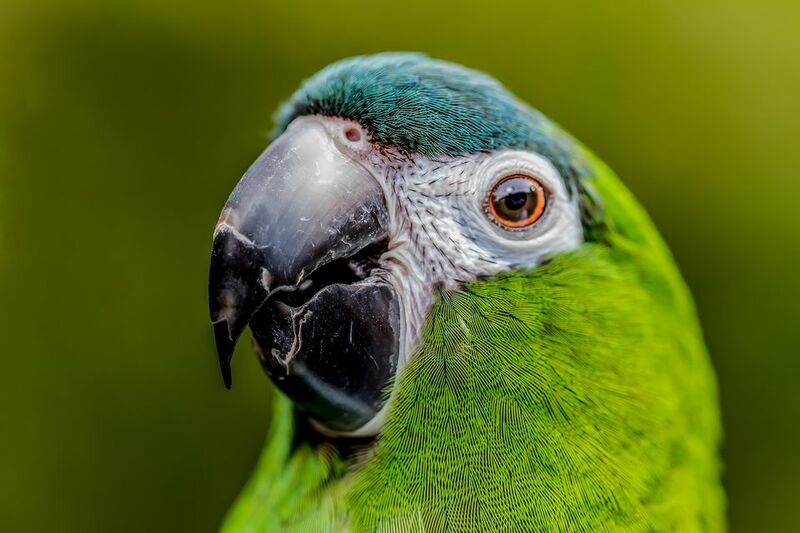 Potential owners need to be aware, however, that while they may be small, they pack all the personality of a larger parrot into that tiny bundle of feathers. This can lead to many fun-filled hours as you enjoy their spirited antics. If you adopt a Hahn's macaw, don't be surprised if it decides to assume the role of your morning alarm clock. They can and will get noisy when they feel like it, and a pair of macaws will only increase this tendency. Overall, the Hahn's macaw tends to be a very gentle bird. If you adopt a young bird, it may nip a bit, but they usually grow out of that habit. They will also calm down as they mature. When socialized, they can be sweet little birds that get along well with children as long as both parties are taught to interact properly with one another. Mature Hahn's macaws are primarily green with a darker greenish-blue cap of feathers on their foreheads. They have a spot of bright red on the undersides of their wings, which lend to their red-shouldered macaw nickname. This bird's beak is black with a beige to white color in the upper beak. Their eyes resemble a burnt orange color and are framed by the macaw's classic white eye rings. Hahn's macaws have black feet that seem to be oversized for their small body, though they are quite nimble. To accommodate climbing and the handling of food and other objects, two of their toes point forward while two toes point toward the back. These macaws can be mistaken for Sun conures and for the Noble macaws. The Hahn's macaw has the smaller beak of the two macaws, and the Noble macaw's beak is completely beige. At second glance they're pretty easy to distinguish from one another. Personality traits aren't where the similarities between the Hahn's and larger macaws end. Because they are true macaws, they need all the social, dietary, and exercise requirements that come with larger birds. Those interested in owning a Hahn's macaw, or any other parrot, should be sure that they have plenty of free time to spend training and bonding with their bird. A bored macaw can become an angry, destructive bird. That only results in sore fingers, frustrated owners, and sometimes even damaged property. These birds can even become depressed, especially if left alone for long periods of time. Any neglect may lead to self-mutilation or feather plucking, which can cause even more serious health problems. Prices for veterinary bills, quality feed, toys, and cages add up quickly. If you can't give your bird the best of everything, consider holding off on adopting one until you can or choose a pet that might be a little more low-maintenance. Hahn's macaws should be fed a diet consisting of a high-quality pellet and seed mix. This is in addition to daily servings of fresh fruits and vegetables, which make mealtime a fun spectacle to watch. These parrots will be delighted with dark greens like kale and spinach as well as broccoli, carrots, squash, and even some chili peppers. For fruits, consider staples like apples, peaches, oranges, and pineapple. Many Hahn's also like bananas and figs. Just be sure to clean up any fruit leftovers to keep the cage clean and free of ants. Some parrots can become picky eaters, but you can diversify their diet by introducing new foods slowly. Do not feed these birds avocados, chocolate, or alcoholic beverages as they can be toxic. Social and intelligent, Hahn's macaws respond quickly to training. This also provides mental stimulation that can keep your bird happy and healthy. You will have a lot of fun teaching these little birds tricks, and new ones should be introduced throughout their lives. Though not every parrot will talk, many Hahn's macaws are quite gifted in this area. With training, males and females will develop an impressive vocabulary of words, and you'll enjoy their high-pitched and rather clear voice. Like all parrots, wild Hahn's macaws are built to fly for long distances every day. In captivity, a Hahn's macaw also needs an adequate amount of time out of the cage to play, exercise, and stretch its muscles. Provide your parrot with at least two hours of supervised out-of-cage playtime a day and your bird will be a healthy and well-socialized pet. With these parrots, it's best to ignore unwanted behavior—including excessive noise—rather than resort to scolding. At the same time, reward good behavior and quiet moments and your little bird will soon pick up what is wanted and not wanted from you. They do aim to please their dedicated keepers.